Large violet flowers on tiny-leaved, compact mats. Such a long name for such a short plant but that is its only fault. 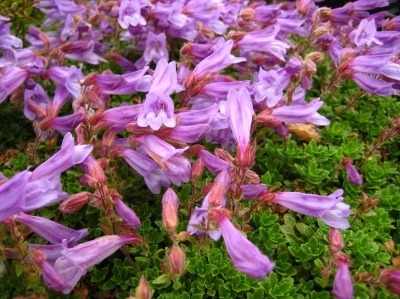 A very desirable plant - dense, spreading mats with small green leaves carry large heads of violet Snapdragon flowers in early summer. Will look good trailing over the edge of a stone trough or in a selected spot on the rock garden. Likes sun and well-drained soil. About 5 to 7cm (2" or 3") when flowering.